The first thing I decided was that I needed a focal point. So I made a bower bird using the wonderfully written and very photo-heavy tutorial from Attic24. 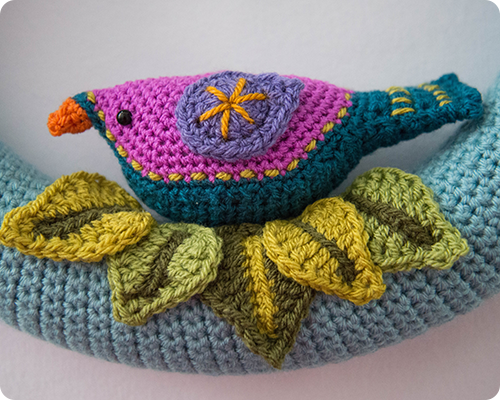 I especially love the embroidery stitches and how they add a little kitschy detail to my bird. Okay, so once my focal point was decided on, I made a second triple layer flower, (I made my first back when I first began working on my wreath), as well as a collection of leaves in various shades and combinations of green. 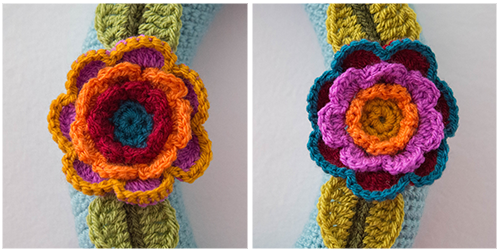 Patterns for the triple layer flower and the leaves can be found at Attic24. You'll notice that I used the same colors for all my decorative embellishments, simply changing the order of them. I wanted everything to coordinate together, but not be too matchy-matchy. And then it was time to arrange things on my wreath. I positioned my flowers on either side of the wreath with my bower bird nestled in a bunch of leaves at the bottom. I considered making a few more flowers, but I really liked the simplicity of what I had created. It was then that I decided that a less-full wreath was what I was making; while decoration laden wreaths are gorgeous, clean and simple is much more my style. Sewing everything on to my wreath was not easy, there were some tense moments, but in the end all the things were secured. I spent a few days glancing at my wreath, second guessing my decision to stay simple, but in the end I stuck to my guns. Simple, symmetrical, and colorful...and I love it. My wreath was undoubtedly inspired by the gorgeous and breathtaking wreaths over at Attic24, and I loved taking various elements from those creations to make a wreath that is all my own. So cute! I've never made one of Lucy's wreaths but I remember when they were all the rage a few years ago and people were practically begging for her bird pattern! 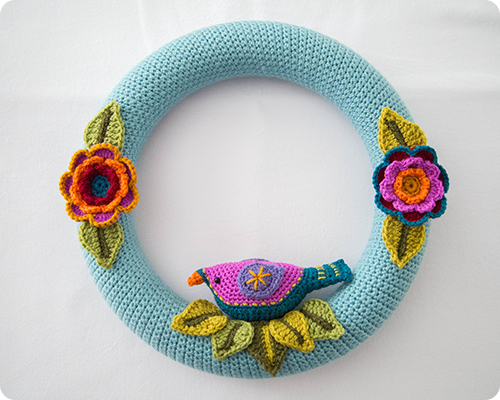 Your wreath is perfect for springtime. I know...Lucy's wreaths were so popular and absolutely gorgeous. Thank you for your sweet words, Jennifer.